Published March 27, 2013 By Anna T. This post may contain affiliate links. Regardless, I only recommend sites I've researched and/or used and trust. 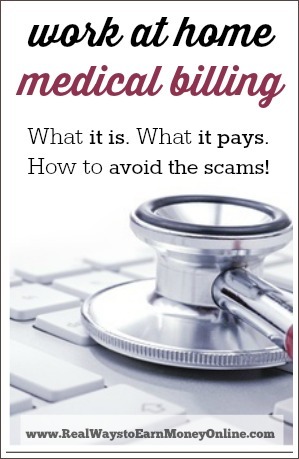 Many readers ask me about medical billing from home, so today I've done the research to help you understand exactly what it is, what it pays, and — most important — how to dodge the many scam opportunities you might come across when seeking out this type of job. While medical billing is totally for real and many people are able to make a decent living from home doing it, it definitely doesn't count as entry-level work. The first thing you should know about the work from home medical billing “opportunities” you might find online is that many of these are not actually work at home jobs, but rather someone trying to sell you information on how to start your own medical billing business. Why is this misleading? It is because the advertisements make it sound as though you are going to work for someone, or for a company, rather than just paying for information that may or may not even help you. With that said, you can get paid to do medical billing from home, but as mentioned above, it's not nearly as easy to get started as many scammers would have you believe. Medical billing involves billing insurance companies for healthcare services provided, billing patients, sending claims to insurance companies, and appealing claims denials, among other things. To do the job, you'll need to have an understanding of medical terminology, human anatomy, and the medical coding system. You will need to know how to type. Customer service skills are also very important because chances are good you'll be on the phone frequently with doctor's offices, insurance companies, etc. once you start working. According to Salary.com, most medical billers make around $37,000 per year. You do need some training to get started and while there are several schools you can use for the training, it's best if you stick with one that is accredited. Many vocational schools do offer medical billing courses which can take as little as nine months or as long as two years to complete, and some of these also offer help with job placement just out of school. You will not be able to find a business that will hire you for medical billing unless you have either had some schooling or past work experience. Where Can You Go For Training? It might not be a bad idea to check around in your local area for a college or tech/vocational school with a medical billing program. These schools may additionally have options for you to complete your courses online or mostly online. CareerStep also has online training for aspiring medical billers/coders and they are widely recommended, plus they have flexible payment plans that make it really easy for anyone to afford it. Many companies are quick to hire CareerStep graduates. This is the company I always refer readers to when they ask me about reputable online training for medical billing from home. Is Medical Billing 100 Percent Home-based? What you will find when you begin looking for medical billing jobs from home is that most doctor's offices, pharmacies, and insurance companies that hire medical billers do not offer a work from home option to start. In most cases you will not be able to work from home until you've worked onsite for a certain period of time. Once you prove yourself working onsite, you may then be given permission to do the work from home. If you are getting into medical billing primarily because you want a work from home career, keep in mind that there are some companies out there that may never be willing to let you work from home. You will need to check and make sure that the potential to work from home at some point is there before agreeing to employment if that is important to you. Many work from home medical billers do run their own home businesses. You can either attempt to dive right into this after getting the schooling you need, or you can take time to work under someone else first before trying to go it alone. As with any home business, there will be some start up expenses. These will include home office equipment, a business license, medical billing software, reference books, and more. However, medical billing is something that there will likely always be a need for since health care is always in demand, so if you go about things the right way, you may be able to do well with your home business. Good luck if you decide to pursue medical billing from home! I have been doing medical billing for more than 10 years. One of the first things I tell people is that this is a field in which you never stop learning as there are many changes throughout the year that you MUST keep up with. I worked a a clinic for 7 years until I decided to open my own billing service from home. It went well for a while but many of my clients were older doctors about to retire and when they did it was hard for me to get new clients. When I did get new clients I stopped working for them as they would not pay me I guess my contract was not strong enough. If I can give you any advice when you open a billing service invest in a lawyer that specializes in healthcare in order to draft your contract and to make sure you are protected and that you can fight In court with those clients that refuse to pay you. Also having your work at home makes it easier for you to overwork you have to establish a time frame for work and let your clients know of these times as I have clients call me at 3am because they just thought about something and they did not want to forget to tell me later on, in other words: set your boundaries not only with your clients but with yourself. And Ive been working in the medical filed for 13 years and i;m ready to start working from home. How can i go about doing that?